A new Chronojet Unit appears that supports Calling further Zodiac Time Beasts. CONT (RC) GB1: If you have a “Chronojet” Vanguard, this Unit gains Power+2000 and “CONT (RC): [CB1] When this Unit attacks a Vanguard, you can pay the cost. If you pay it, look at a number of cards on the top of your Deck equal to the number of your 〈Zodiac Time Beast〉 Units, Call up to 1 〈Zodiac Time Beast〉 with a different name than this Unit to (RC), then place the remaining cards on the botom of your Deck in any order.”. For Today’s Card, we’re introducing from the 12th Booster “Dragon King’s Awakening” (on sale August 25th, 2017), the 《Gear Chronicle》 card, “Pulsar, Spear-head Unicorn”. 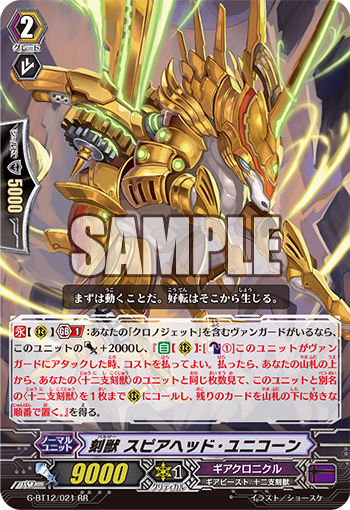 “Pulsar, Spear-head Unicorn” is a Unit that enhances 〈Zodiac Time Beast〉, as you can activate its ability when your Vanguard is a “Chronojet”. At GB1, its base power is 11000 and it also has a ability that if it attacks a Vanguard, you can Counter Blast 1 card, then for each 〈Zodiac Time Beast〉 Unit on the board you can look at a card from the top of your Deck and call a 〈Zodiac Time Beast〉 other than “Pulsar, Spear-head Uncicorn”! If you Call “Pulsar, Spear-head Unicorn” with the skill of “Metapulsar, Avenir Phoenix”, you’ll be good at increasing the number of chances to attack. Also, since it’s a continuous Skill, it is active even during the opponent’s turn, maeaning its a Unit that defends with 11000 Power as well. That way you can deflect your opponent’s attack, and aim to activate its ability during the next turn. We’ll be introducing more cards from “Dragon King’s Awakening” in future “Today’s Cards”! Please enjoy!